At 14 Rock Street, the fishmongers shop had a huge sliding sash window on to the street to display the fish counter. The window was open no matter what the weather and the owners would be serving fish with fingers red raw from wet and cold. Opposite in 19 Rock Street, lived Harold and Mary Cushing. Ken remembers Harold as a clever, phlegmatic man who built a loom. Mary wove material on that loom and made a suit from it. Next Door at 18 Rock Street, Mr Islip the tailor would sit in the window, sewing cross legged in the good natural light. Many famous people lived in Lewes Crescent then. Bill Rose who wrote the script for the popular 1950’s film ‘Genevieve’ lived at No.26 Lewes Crescent. Patrick Allen, actor, and his wife, Sarah Lawson also an actor, lived in Lewes Crescent. 16 Lewes Crescent was a dormitory for Brighton College. Some of the houses were still in single occupancy, for example, 4 Lewes Crescent where Mrs Knight lived with help from housekeeper Miss Botting, and Miss King, the maid of all work. Rose & Crown, Chesham Street, pub. 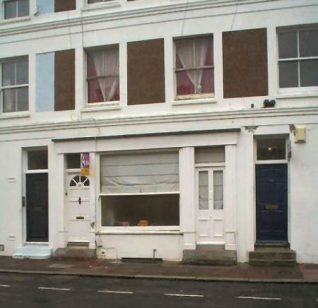 I would like to say that the name of the occupants of No19 Rock Street Kemptown, Brighton were Horace Cushing and Mary Cushing (Not Harold as stated). I also worked on Mary Cushing’s loom as I was their foster daughter for many years. I made a jumper on that very loom my foster father Horace Cushing had made for my foster mother. She and I spent many an evening on it with her teaching me how to use it. A wonderful piece of work that loom was. Horace made a lot of little bits from the wood he had stored out back in the old shed. I had quite a wonderful time living in that cottage as a child. Horace made me a lovely dolls bed for my two dolls, Mary and Pamala, one year as a Christmas present. It was a beautiful shape and highly polished in a very dark wood. He also made my sister and I a stool each with our names engraved on them. Mary his wif, my foster mothe,r was very Victorian in her ways and bought us up in that way. She was a great dressmaker and made nearly all my dresses which were beautiful with ribbons of the same material to match the dress for my hair. They had moved from the Midlands after my foster mother was badly injured in an accident up North. Horace bought her to live down here for the sea air. She gained strength from this and would push herself down to the seafront in her wheelchair and pull herself up gripping the Victorian railings along the top of Maderia Drive and teach herself to walk again, and she did it with such courage. Mother also did sewing for Anna Neagle, Peggy Cummings and one or two other stars who lived in Sussex Square,and Lewes Crescent. They sold 19 Rock Street in about the year 1959-60 and moved to Lavender Street as by then Mr Cushing was running a building firm. That building has since been pulled down and flats stand in its place. But 19 Rock Street still stands proud. I admired my foster mother very much for her strength and courage and determination in getting on with her life regardless of her health and very scared face. Mother had beautiful short wavy hair and I was taught/made by her to brush my hair- so many strokes a day. Although she was very strict she was a good woman. Horace and Mary Cushing were married for such a long time and remained with each other till their respective deaths. 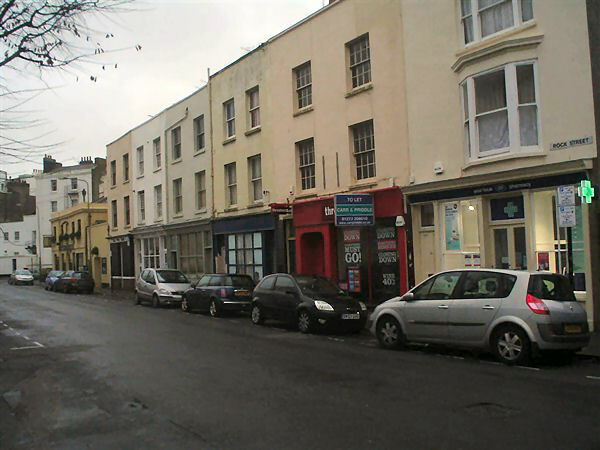 I have just bought GFF 11 Rock Street, about the time this picture was taken. Looking in the 1841 Census it is shown as being a bakers shop run by a widow from London Mrs Ann Capell and four children. In the 1851 Census she still has the business and three children listed along with a servant. Over the years it changed to a boot makers then a grocers. If any one has any old pictures I would love to see them. In 1871/1881 my great great grandfather owned no 3 Rock Street and traded as a butcher. His name was Charles Jenner. I have taken this information from the census records of those years and do not know the dates when he traded there from and to. If anyone has any information when this may be or any pictures of the shop/occupants from that time, I would love to hear from them. Rob, (29/03/2010) I read your piece about 11 Rock Street with great interest because the bootmaker was my second Great Grandfather. He was a cordwainer and my Great Grandfather lived there before he married in 1900. My second Great Grandfather died in 1911 and then my Great Grandfather moved into the house. Before that my Great Grandfather had lived at number 9 Rock Street and was also a boot and shoe maker. Names are: George Wood 1840 to 1911 – second Great Grandfather; John George Wood 1876 to 1959 – Great Grandfather. Sorry I have no pictures but if there are some out there I’d love to see them too. No 1, Gibsons the chemist; My mother photographed the Gibson family in the early fifties, Mother Father and two children. I found the negative recently. No 4, in 1950 I bought the first copy of The Eagle (comic) in Browns newsagents. The Rock Inn; The landlord was Dave Caplin, I think he had a Ford Consul. My parents usually went there on a Friday night. The Hervey Arms; This is the family name of the Marquis of Bristol who in the 19th century lived in two of the houses at the top of Sussex Square named Bristol Mansions. In the 1950s the clientele was pretty rough! No 11, Webbs greengrocers; Their son Teddy had been in the Navy during the War and his ship had been torpedoed (in the Pacific I think) and he survived by hanging on to floating wreckage for nearly two weeks before being rescued. They lived in Woodingdean and had a grey Commer Express delivery van. When they closed at lunchtime Teddy would often take me and my bike back to Fitzherbert at Woodingdean. Saved me a lot of pedalling up Wilson Avenue! Does anyone know where they went to? No 14, Trethewey (I always thought it was Trethewery but am probably wrong) had a Standard Vanguard with silver grey ‘polychromatic’ (metallic) paint, unusual at the time and an expensive extra. One of the next houses listed as private (Nos 15 to 17) was occupied by a silversmith who did repairs and had items for sale in the window. My mother bought a silver pepper and salt set from him which I still have. No 19; This had a yard up St Mark’s Place at the back where there had been in earlier days a blacksmiths and wheelwrights. The Rose & Crown pub; When my grandfather Lawrie Sargeant had The Clarence Garage opposite St Mark’s Church in Eastern Road just after WW1 he sold the landlord there a motor car. Unfortunately the landlord hadn’t had any driving lessons and ran someone over and killed them for which he was sent to prison. Driving tests didn’t come in until 1936.